Peel the hardboiled eggs. Cut them in half lengthwise. Carefully remove the yolks and place them in a medium-size bowl. Combine yolks with mayonnaise, red onion, jalapeños, cilantro and lemon juice, and season with salt and pepper. Fill the cooked egg whites. Top with pieces of sliced jalapeños and fresh cilantro. Serve and enjoy! To save time, you can make the hardboiled eggs up to 3 days in advance and assemble them the day of the party. 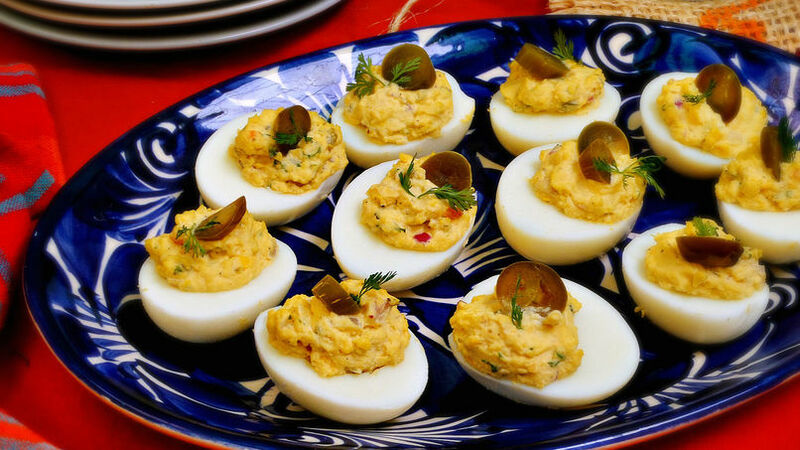 Deviled eggs are a classic appetizer that’s almost always present in parties and gatherings. Today we’ve given them a Mexican touch by adding jalapeno and fresh cilantro for a spicy and delicious version of this popular recipe. Make them for your next party and watch them disappear.